Senator Claire McCaskill is one of the hardest workers in the Senate. She’s an independent-minded straight shooter who goes the extra mile to help Missourians. She’ll go anywhere, talk to anyone, listen to everyone (Republicans, Democrats, or independents) to get the job done. When Missourians have a problem, Claire doesn’t let politics get in the way of a solution. She can’t stand partisan nonsense. She believes in working with whomever has the best idea to get the job done. That’s why, whether they agree with her or not, Missourians appreciate all that Senator McCaskill does. Missouri families know they have someone fighting for them in Washington. She’s held 50 in-person town hall meetings this year alone–and she’s not done yet. Claire is trekking across Missouri talking to seniors in Maryville, business owners in Ozark, and countless others in between. She’s talked to people who say they’d never vote for her. She’s listened to city crowds and small groups in rural community centers. She’s traveled to corners of Missouri where people are used to being ignored. She answered every question. She heard every concern. And she doesn’t just listen; she acts, too. "Whether they agree with me or not, every Missourian is my boss, which is why I consider it a must to go to every corner of the state I love, to hear those ideas and concerns directly, and hold myself accountable to Missourians"
"Claire McCaskill is very even. She’s neither liberal nor conservative. She’s middle of the road, hardworking and she listens to the people"
"She listens to the issues and she’s not afraid to address the issues"
Sen. McCaskill held 50 town halls in 2017. 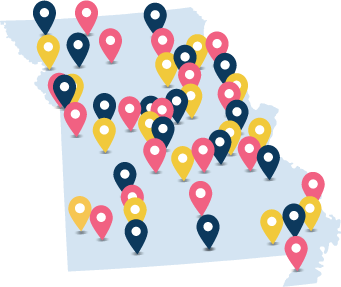 Sen. McCaskill held 46 town halls in 2017. She’s not done yet. McCaskill learned a long time ago that being a woman in politics required her to work harder. "I found that if you are informed and work hard, you can earn credibility," she wrote. McCaskill opened by asking who in the crowd of about 100 would be "absolutely positive" about never voting for her and a few hands went up. To show she did not screen questions to take those favoring her, she asked a member of the "no McCaskill" group, Bud Knight, Warrensburg, to draw the questions and to ask his own last. 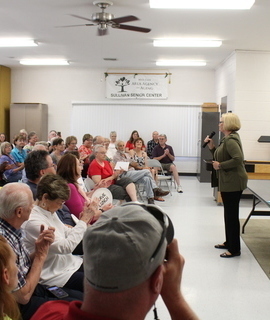 When U.S. Sen. Claire McCaskill said someone had accused her of hosting town hall sessions only in places where people liked her, the crowd in Monett laughed...In order to ensure that the questions weren’t prescreened, people who said they would never vote for McCaskill were allowed to hold the basket.